When I started to work as an IT consultant after leaving university, soon I had to travel quite a lot. My typical working week started on Sunday afternoon when I set out on a trip, I reached hotel in the late evening, got a beer at hotel bar and went straight to bed. During the week I spent between 8 to 12 hours sitting in front of computer in customer’s office and after work just occasionally made some walk (sightseeing when new to town). On the way to the hotel I bought some packaged food at supermarket or had a fast food meal. Whole Friday afternoon and evening was usually consumed by travelling home eating some airport food. We often spent Saturday and half of Sunday with my girlfriend visiting parents (including weekend lunch of course). On Sunday afternoon travelling again. I ate whatever I could grab but I always tried to choose the “healthy” option, there was no chance to participate in any regular group fitness activity, and there were plenty of stressors at work. Whenever there was a brief (couple of weeks to months) period when I did not have to travel I tried to attend Capoeira classes twice a week to get sweated a bit. We were hiking, in-line skating or doing bicycle trips during the weekends. 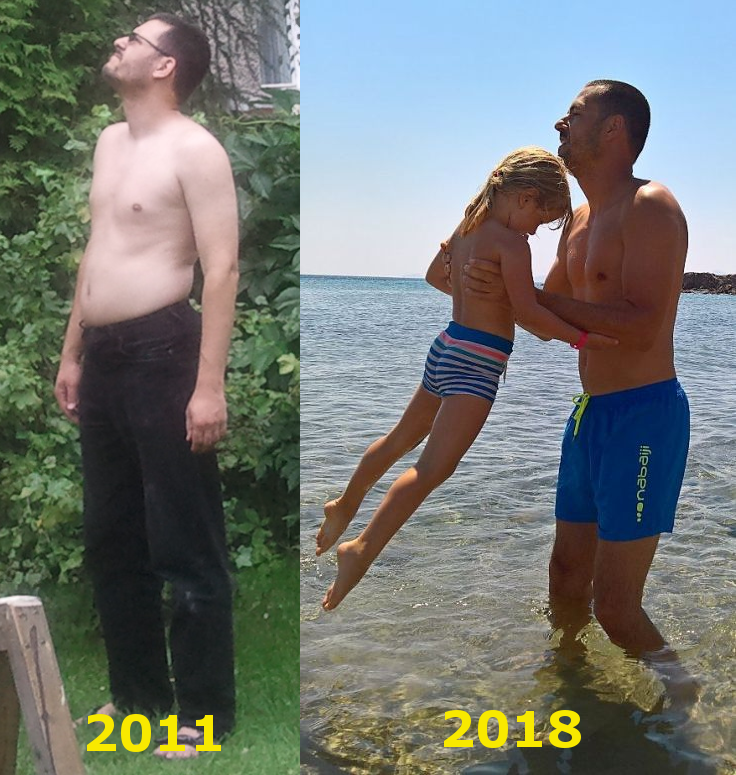 During the next 10 years I slowly got 10 kilos of extra weight and no matter what I did (I even bought Wii Fit and spent around 45 minutes a day exercising on it) I could not shed them off. Moreover, since my puberty I suffered from nasty acne (luckily mostly on my back) traditional doctors could not deal with. Their treatment consisted of repeatedly prescribing some ointments to cover the acne. They never tried to figure out what was triggering it. My digestion wasn’t in a good shape either (it was very quick though), I was often bloated no matter what I ate. During a preventive health check at age of 33 they found out I had borderline normal to high blood pressure. So, they strapped this blood pressure meter on me and I had to wear it for 24 hours. If it would measure high value throughout most of the day they would put me on blood pressure lowering drugs for the rest of my life. Eventually I landed in the high end of the normal zone, so they did not give me the drugs, but it was a huge wake up call for me. I was leaving the surgery with doctor’s advice (aligned with conventional wisdom) to limit fats and red meat intake, eat more cereals (whole grain preferably) eat more vegetables, move more etc. I was already doing all of that and it obviously did not lead to better health. It was clear to me that I had to do something with myself in order not to end up eating pills for blood pressure, digestion and whatever else every morning for the rest of my life. Few months after the health check when I was browsing Internet an ad for a book by Mark Sisson called Primal Blueprint popped up at me. There were these statements on the cover “Forget everything you thought you knew about diet, exercise and health! It’s time to go back to the beginning…” and “Reprogram your genes for effortless weight loss, vibrant health, and boundless energy”. These statements sounded so crazy to me that I thought that this guy must have been either total lunatic or genius. It just could not be that simple! But what if it could? I ordered the book and read it within a few days. All my initial doubts vanished once I found out that all the main ideas and principles presented in the book were supported by results of latest science research. Overall it just made so much sense. So, I started my 21 days experiment by eating just Primal approved food. After just three weeks I wasn’t even surprised that I lost some weight (that seemed to be so stubborn last couple of years) without any change in my exercise level, my digestion improved rapidly, bloating disappeared, and acne improved. The typical after dinner energy crush also disappeared. But the most exciting change I noticed was in my energy levels and endurance during Capoeira classes – in the past I used to be exhausted and was barely catching my breath after just the initial warmup and suddenly I had plenty of energy throughout the whole training. Since then I stayed with eating Primal food and during next 6 months I got effortlessly to my ideal weight. The best part was that I never had to suffer with hunger, count calories or stick to any prescribed meal plan. Today I eat delicious meals that I like, and I enjoy moments spent in the kitchen while often experimenting with new recipes. Primal isn’t just about food but also about changes in whole lifestyle, the way we move, making play part of our lives again, getting enough sun exposure, keeping our brain in motion and much more. Thanks to all these little lifestyle changes I handle stress and enjoy life better today and do not take many things as seriously and I used to. I realize that no one will take responsibility for my health and wellbeing except of myself. No doctors or magic pills can cure diseases caused by poor lifestyle habits. Today I feel better, enjoy better fitness and have more energy than 10 years ago. Having this personal experience, I decided to leave my career as IT consultant after more than decade of work for multinational companies and start my career as Primal Health Coach. Getting my certificate just gave me the confidence and extra motivation to pursue this path. I know there are many people out there I can help to better health and overall higher quality of life. My mission is to help others with transition to Primal lifestyle. I know that many people out there who are confused by all the conflicting information coming from different sides and who do not know how to reclaim their health again could thrive on Primal lifestyle the same way I do. I also want to spread knowledge about this healthy lifestyle that generations of our ancestors lived until not that long ago and help to break the modern myths about healthy eating and workout. After all Primal is not yet another fad diet, instead it is the way humankind lived for millions of years and we just managed to forget it somehow. Let’s rediscover it together. Society full of people actively taking care of their health and wellness who realize they can prevent and often even reverse lifestyle diseases by changes in their lifestyle. Greater awareness of Primal as a simple lifestyle, naturally leading to firm health, great fitness, longevity and overall wellbeing.